Buy Ceremonial Cacao 1kg – Get 10% OFF! 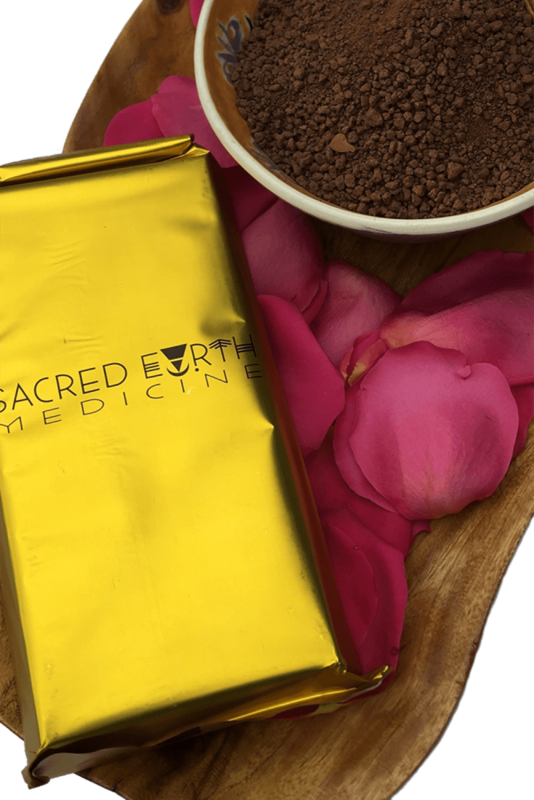 Chocolate Yoga is giving you 10% off Sacred Earth Medicine Ceremonial Cacao when you purchase 1kg (2x 400g + 1 x 200g). Wahoo! 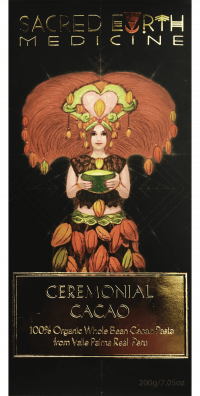 With more delicious Ceremonial Grade Cacao to go around, your ceremony can be enjoyed by more people, or simply take the opportunity to go deeper. We wish you many blessings on your ceremonial season, wherever it may lead you! According to an ancient legend, Cacao was bought to earth from the heavens on the beam of a morning star. 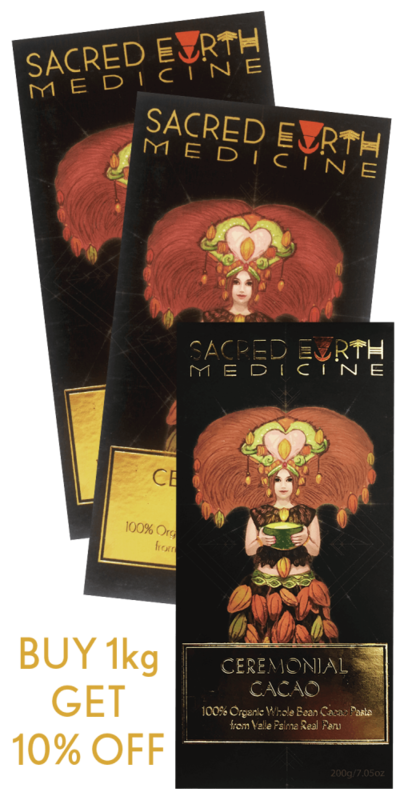 Sacred Earth Medicine offers you Ceremonial Cacao so you can bridge heaven and earth and commune with the Cacao Deva – Goddess of love, fertility and abundance. In ancient times, the spirit of Cacao was honoured and revered more than gold, we invite you to discover why. & other radical cosmic awakenings! As an ancient plant medicine and wise teacher, this Ceremonial Cacao can deepen awareness of your connection to the earth and the cosmos when used in ceremony,meditation and inner work. For inspiration, try partnering with any creative endeavours. Enjoy your journey, whatever it may be! This package contains 7-8 full ceremonial doses and 14 creative doses. The inside of the pack contains usage and preparation instructions. FREE SHIPPING within Australia and seriously reduced international rates! 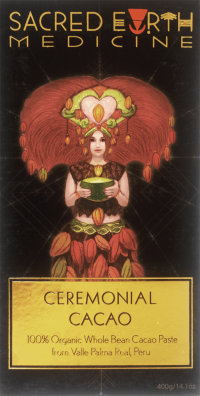 Are you ready to hold a rich, warm velvety cup of this divine Ceremonial Cacao elixir in your hands? Let the sweet aroma steam its way into your sensory organs. As you drink, it melts into your heart, transporting you into another realm of sweet benevolence. Once in your hands, you will cherish why our pure Peruvian Ceremonial Cacao bean paste is specifically chosen for its potency and high vibration. It is 100% whole bean Criollo Nativo, organically grown on the Farm of the Rising Sun, from original cacao trees. This small, humble but proud family run operation keeps production at a sustainable scale to ensure we have superior quality control with techniques fine-tuned by generations in the family. The cacao beans are grown in a powerful microclimate nestled between the Andes and the Amazon in Valle Palma Real, infusing the beans with fervent life force. Grown on mature trees, farmed without chemicals, ethically sourced and fair trade, this cacao maintains all its medicinal and spiritual properties. And once you taste it, you’ll know why it’s won so many awards. Ready for more? Check the inside cover of each cacao block for simple preparation & dosage instructions. Cacao – The Food for the Shift! Buy Ceremonial Cacao 1kg - Get 10% OFF! 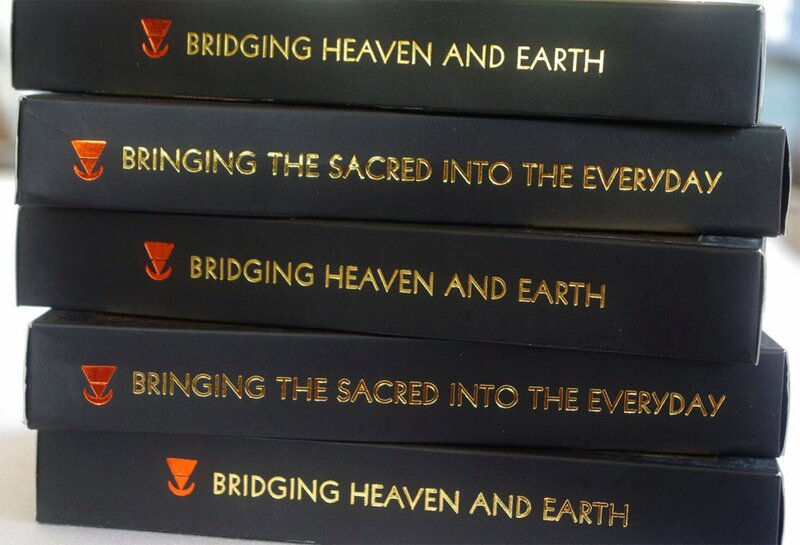 Chocolate Yoga is giving you 10% off Sacred Earth Medicine Ceremonial Cacao when you purchase 1kg (2x 400g + 1 x 200g). Wahoo! With more delicious Ceremonial Grade Cacao to go around, your ceremony can be enjoyed by more people, or simply take the opportunity to go deeper. We wish you many blessings on your ceremonial season, wherever it may lead you! According to an ancient legend, Cacao was bought to earth from the heavens on the beam of a morning star. 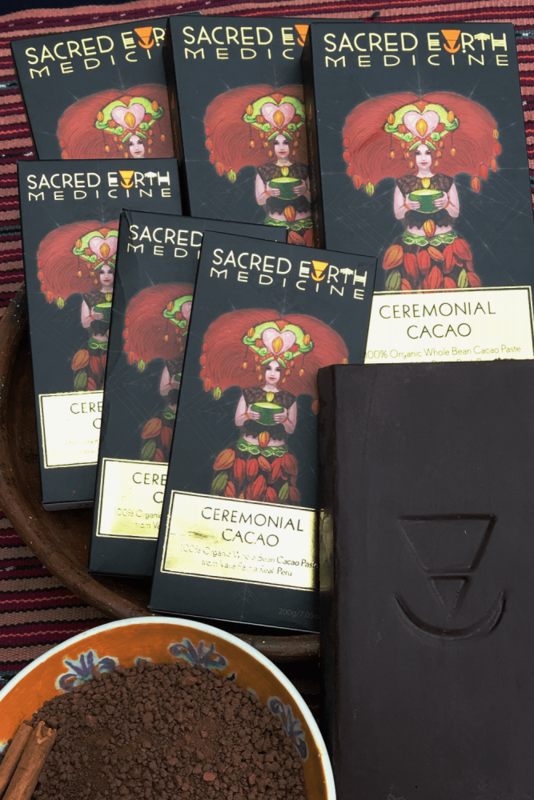 Sacred Earth Medicine offers you Ceremonial Cacao so you can bridge heaven and earth and commune with the Cacao Deva - Goddess of love, fertility and abundance. In ancient times, the spirit of Cacao was honoured and revered more than gold, we invite you to discover why. Friendly Warning! This Cacao may help you: Journey into your heart Inspire creative downloads Experience heaven on earth & other radical cosmic awakenings! 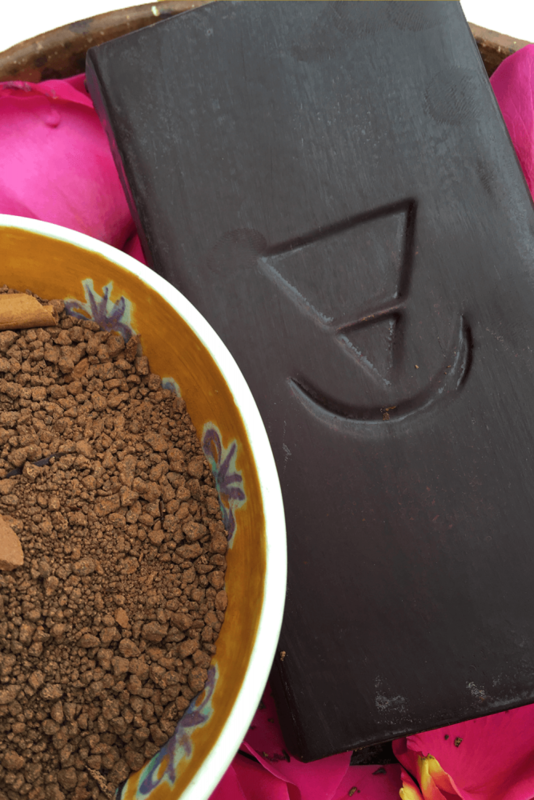 As an ancient plant medicine and wise teacher, this Ceremonial Cacao can deepen awareness of your connection to the earth and the cosmos when used in ceremony,meditation and inner work. For inspiration, try partnering with any creative endeavours. Enjoy your journey, whatever it may be! 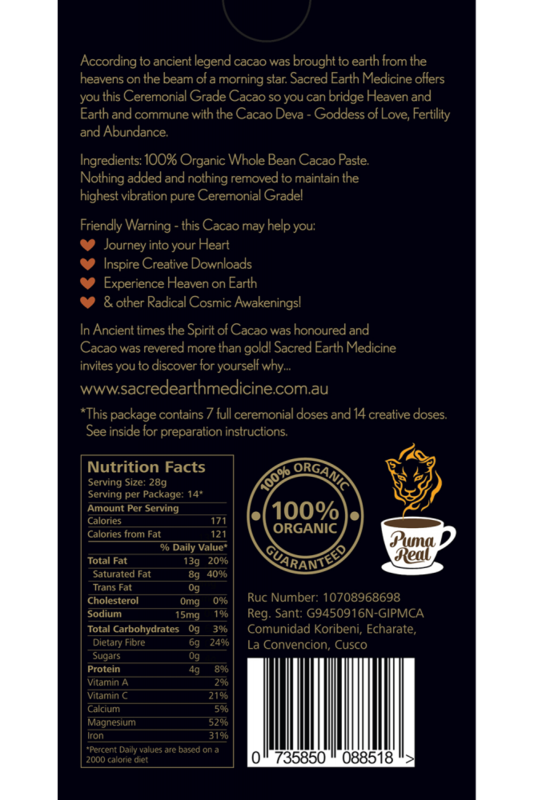 Ingredients: 100% Organic whole bean Cacao paste Nothing added, nothing removed to maintain the highest vibration - pure Ceremonial Cacao This package contains 7-8 full ceremonial doses and 14 creative doses. The inside of the pack contains usage and preparation instructions. FREE SHIPPING within Australia and seriously reduced international rates!